Friday night was super busy. And not just because it was Jenna’s birthday. Grandparents came over in the afternoon, we opened some presents, things were happy! Then Megan and her roommate Sarah came home for the weekend, Hooray! I do love a full house (too full, actually, and Megan and Sarah got to sleep on couches because there were boys staying in their rooms). 6:00 came and it was time to load up the chimes into the car. I picked up John’s friend and we were off to the High School for our playing of the National Anthem at our second basketball game this month. All the kids got there (one in the nick of time, after I called his mom to see if he was coming), and did a great job. It’s such a pain to do these things, but the kids feel like rock stars when everyone stands and applauds. it’s great. After we got all the chimes put away, and back in the car, we dropped the friend off at home, crammed all our people in the car, and headed off to a dinner appointment with Julia and Andres, our Brazillian friends. The exchange students were not with us. 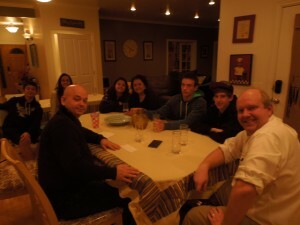 Even though both Ryan and I had asked them if they could come home for dinner, they were at a party with friends. Friends that they had been with ALL day, EVERY DAY, I might add. While we were at dinner, one of the boys messaged that he was getting on the train, and would we be able to pick him up? One? Where was the other one? He arrived at the station at 9:45, and even though we (well, mostly Ryan) would have liked to stay longer with his Brazilian friends, it was actually nice to have an excuse to have to go. We were all pretty tired. So, the boy had to wait about 10 minutes for us, but we brought him home to the warm house. We had no idea when the other boy would arrive, but he had assured us that he ‘had a ride’ home, and we didn’t need to go get him. At 11;15, however, he messaged us to ask if he could stay over with a friend, since a taxi ride home would be $70. “Is that ok?” he asked. Ryan wrote back that that was NOT ok with him. We had no idea where he was, who this friend was and where it was. No WAY would we allow our kids to do something like that, we would be IN the car to get them that minute. However, when we asked where he was, he gave us some address like parkside 255. What? I could just imagine driving around forever trying to figure out where he was. I tried to get in touch with one of the teachers to ask if that was allowed. I didn’t get a reply. Ryan was NOT cool with them staying “somewhere”. I wouldn’t let my own kids do this. Maybe we are too strict. So, I asked him to have the mom of the house call me, and she assured me that he was going to stay with another friend who lived close to her. She was in West Jordan and said they were welcome to stay at her house if we wanted. She had hosted this party for the kids that were going home the next day, and said she’s had such a great time with these kids. It made me SO sad. We should be having a good time with these kids. Instead, we feel taken advantage of, not appreciated, and we aren’t having any fun with them. We are trying, but they act like they don’t want to have anything to do with us. We are merely a place to sleep and a ride to the train station. Yes, we do get paid for hosting, but that’s not why we do these hosting things. 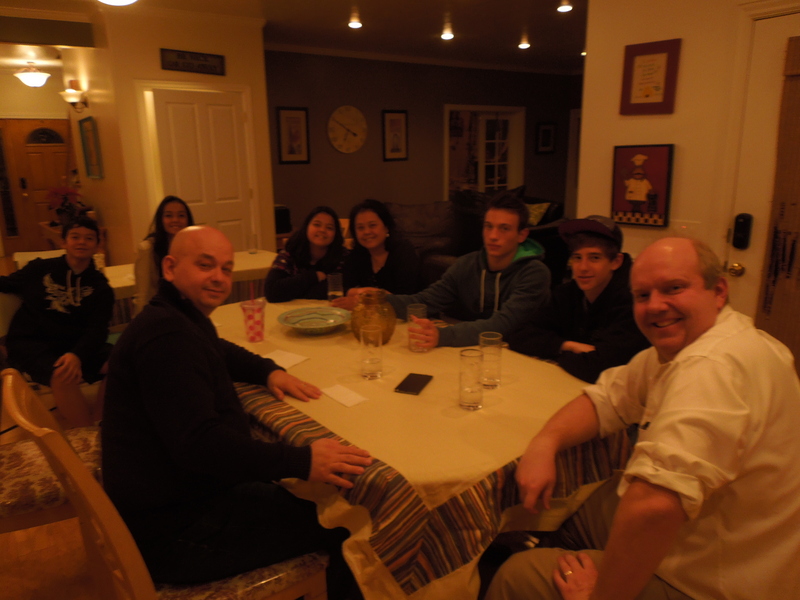 We do it so our family can meet people from different places, and learn a little bit about other cultures. I think all I’ve learned about Brazil is that we don’t ever want to go there, and we don’t really need to meet any more people from there. Anyway, it was 11:30, and we caved and said sure, he could stay with his friend overnight. Probably against the rules, but how would I know that, since I never was given much information about what the rules are. 9:00 curfew? Ha. This morning, Arthur came upstairs and asked if I could take him to the trax this morning. He wanted to be in Salt Lake by 11. I looked it up, and saw that he could catch the 9:15 train or the 10:15 train. 9:15 was his choice, so we left at 9:00. When I got to the train station, I looked at my phone and saw that Lyndsie (also hosting a student) had left a message that she had picked up Henrique from the station, and she had him with her. I hurried and called her and said I ws at the station and could take him. I guess his phone was dead or he would have messaged me. So, I brought him back home. Drop one off, pick one up. As we were driving home, he just said that he would need to be back to the train in an hour so he could get to the ping pong tournament at the school by around 11. I can’t wait for this experience to be over. I came in the door with Henrique, and Megan said to me, “Did you miss the train?” No, we just swapped one boy for the other. I had Ryan drive him the next time. After Ryan came back, he said, “This is the about hardest $1000 we’ve ever earned. I don’t know if I totally agree with that, (try substitute teaching and earning $60 a day) but nothing about this experience has been easy. I figure if I’m driving them to the train and back, that’s 1/2 an hour. Do that twice a day (or 3 or 4 times a day), that’s an hour of driving. Breathe in, Breathe out. One more week. Patience. All of these are things I keep telling myself. Oh, and the big one… “We will laugh about this later”. Right? Oh, and I just opened my email to see that another host family coordinator is looking for families to host kids from France for a month in the summer. Oh, that makes me laugh. Do not talk to me right about hosting other students. Step ball change, jazz square and then the jazz hands? Or was it jazz hands with the Jazz square and THEN the cakewalk thing? We only have one more week of rehearsals until we open our play, Pinkalicious. I play Dr. Wink, who diagnoses Pinkalicious with Pinkititis. I have a whole song and dance number for the doctor. It’s really fun, but with all the dancing, I can’t get the singing right. If I worry too much about the singing, or if I’m already winded from the scene change that we do right before the song, I mess up on the dancing. Ugh. I’m not a great dancer and it takes me a while to get things cemented into my brain, and even when I THINK I have them right, I mess up, still. Today we went over all the dances, and then did a run through. Even though we had JUST barely practiced it, I skipped an element of the dancing cupcakes dance. Rachel, my fellow cupcake followed me, and so we both did it wrong. I thought Felicia had done it wrong. Turns out I did it wrong, Rachel followed my wrong, and Felicia, who had done it right, only looked like she had done it wrong. At night, I have music, lines, lyrics and dance steps going through my head. Over and OVER. 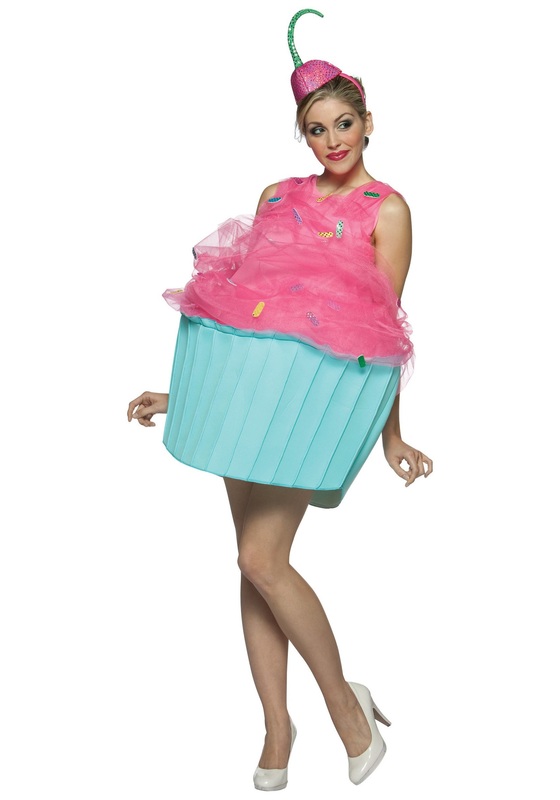 Dr Wink isn’t a huge part of the show, so I’m also a cupcake dancing and a Butterfly who dances and sings. It’s such a cute show. I LOVE the show, I don’t mind rehearsal (once I’m there) and I like the other people in the show (There’s only 8 of us). But why am I stressing out so much about it that it wakes me up at night? I need to get over myself, know that I’ve got it, be confident in myself, and stop stressing. Right. Yesterday we had a costume fitting and I was excited to see what I get to wear. A long white dr’s coat and scrubs. Nothing out of the ordinary there. Super tight blue capri leggings and a pink top go under my butterfly wings AND the cupcake outfit. Well, here’s a picture of the costume. Do you see how short that is? That’s on a small lady, who is maybe a size 2. Imagine what happens when I put that same costume on my body. Let’s just say that without the leggings it would be slightly pornographic. The costume lady did say she was going to add something on to that, or maybe we’ll be wearing a tutu. Something to cover up the thighs, please. I really need to lose about 20 pounds from my hips and thighs, NOW, please. But that’s not going to happen, even with all the dancing and sweating I’ve been doing. Anyway, I’m sure things will work out. I’m going to work on my memorization all weekend, do the dance in my living room, sing the songs in the shower, the car, at the piano, etc. Let me start with….My hubby is the BEST, and without him, I would be throwing things (or people) through a window. Sunday I went in for an interview with a member of the Stake Presidency who used to be our bishop. I told him we had these exchange students and that it wasn’t the smoothest of experiences we’ve had, in our years of hosting exchange students. He and his wife have also hosted Japanese boys and Chinese girls in the same program as we have, so I knew he would understand. Yeah, and we don’t really speak the same language either. I’m trying not to complain too much, but when they got home from soccer playing at nearly 1:00 (on a school night? Yes) and then, just as hubby was coming back to bed and was falling asleep (I slept through their arrival, of course). There was a knock on our bedroom door because one of them had lost his phone and thought it was in the car. ARRGH! I just sent an email to one of the coordinators asking if they could speak with the boys about courtesy, saying thank you, and generally trying to act a little nicer to the hosts. I don’t know if that will help, but I HOPE so. We’re into this thing 1 1/2 weeks, and we still have 2 1/2 weeks to go. Ryan is the one who is driving them back and forth, so really I shouldn’t complain at ALL. Yet here I am. Complaining. 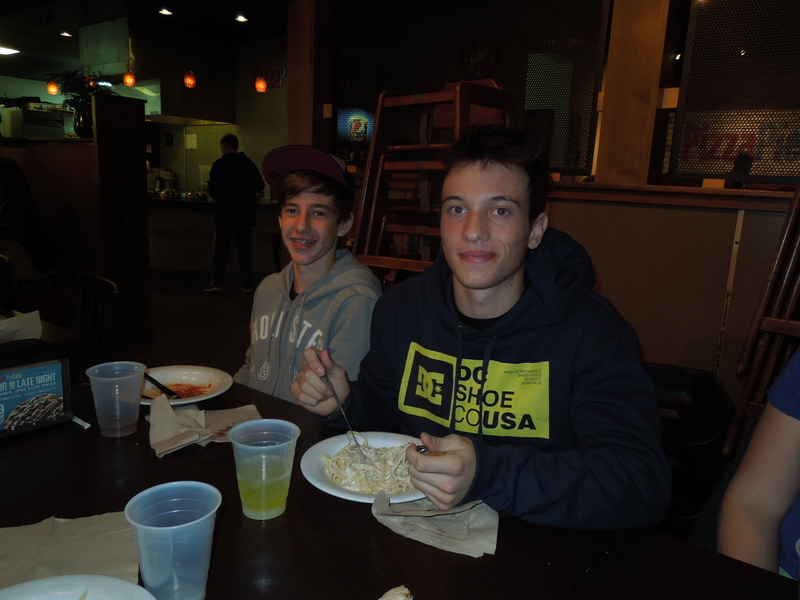 It’s been over a week now and we are getting more used to having these Brazilian exchange students with us. Yes, they found their luggage and they don’t seem to be getting lost anymore. But since they have the freedom to GO places, it seems that’s what they want to do. We had kind of expected them to eat with us, or be here on the weekend so we could do something together with the family. That is not their plan, however, and they are wanting to spend their time with their friends. On Friday, I had asked them if they had any plans for Saturday, and they said no school. I assumed that meant no plans, but alas, they wanted to go shopping with friends. We were kind if irritated by that because we had planned the day. So, we DID get to do some things with them on the weekend, but I’m not sure how happy about it they were. 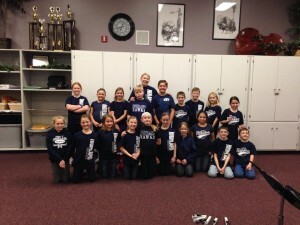 Saturday we went to John’s jr Jazz basketball game, then took everyone bowling. For our kids, that’s one thing we HAVE to do with exchange students. I think they did have a good time with that, and it allowed us all to loosen up a bit. Then we went to dinner at Pizza Pie Cafe. 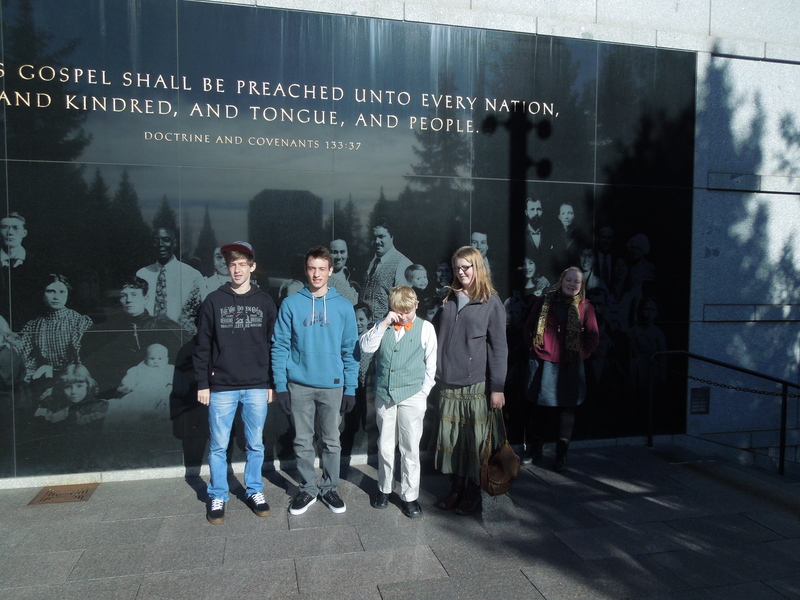 Sunday morning we took them up to Temple Square for the broadcast, and then did a tour of the conference center. Probably really boring for them, but…Oh, well. Then we dropped them off at the Gateway Mall so they could do some shopping and have lunch with some friends. WE had told them we needed them to be home before 5 because we were having some other people over for dinner. Sunday night was kind of fun. A sister that Ryan baptised while on his mission in Brazil was here in Utah with her family for a bit, and we invited them over. The Portuguese speakers outnumbered the rest of us by 8 to 4, but I didn’t mind. The boys actually talked during dinner and didn’t disappear down to their rooms as soon as dinner was over. It helps that Julia has two beautiful Brazillian daughters that they could talk to. 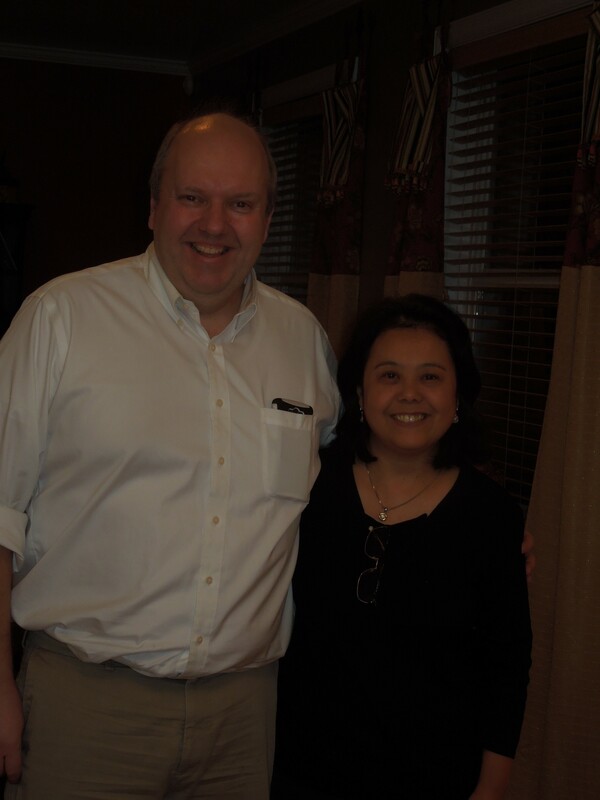 It was a fun evening, and a good reminder of the blessings that come (even many years later) from serving a mission. This morning it was my turn to drive the boys to the trax station, and I tried to get them up. I knocked on a door and asked if they were awake, and saw the light on in the bathroom. However, when it was time to go, they were still not upstairs. I called to them, and they said they were coming, but did not. It looked like one of them was ready, the other was not. Ryan had to take them, anyway, because by the time they came up, there was no way they would make the train, and would have to catch the later one. So, we have 3 more weeks with these kids. We are learning to chill out and not expect them to want to participate with us. We are a “hotel” and “taxi”, not a “host family”. And I think I’m ok with that now. Sunday we got to perform on Music and the Spoken Word for a special for Martin Luthor King day. We played “Every time I feel the Spirit” on the bells, and then we stood through the next song, which was “Down to the River to Pray”. I’ve loved that song for quite a long time, since I first heard it in “Oh, Brother, Where art thou” (one of my favorite irreverent movies). Because who doesn’t love hunky George Clooney with his hair slicked back with Dapper Dan. I have that album and In 2010, Timberline Middle School performed a piece that Mack Wilberg had arranged for them, Down to the River to Pray. He arranged it FOR them! It was quite a big deal, and Dr. Wilberg was there at the concert. 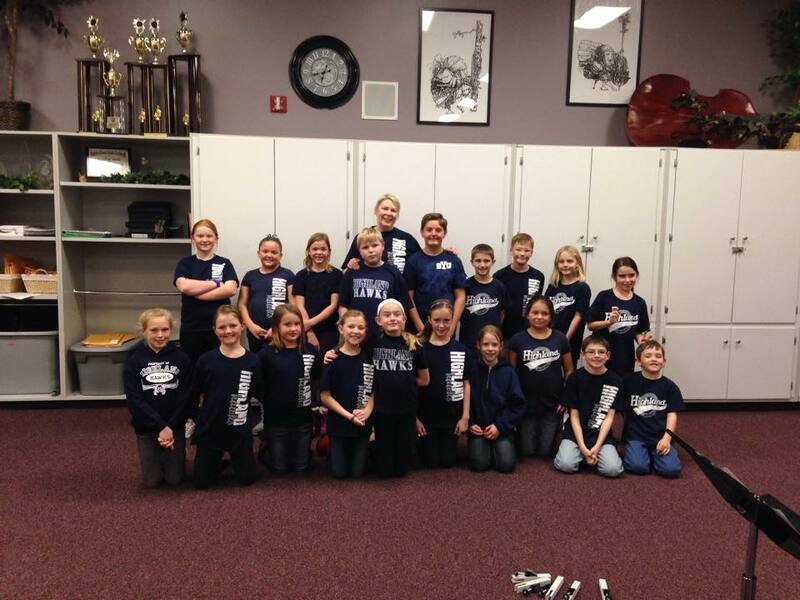 Cole was playing the flute in the band back then and I was so impressed with their Grand Concert. So, on Sunday, when I heard them rehearse that number, I was excited that I could be right there, between the choir and the orchestra, to listen to the program. My family came up to Salt Lake to watch the broadcast, too, which was kind of special. Since we had these boys from Brazil here, we are trying to show them the sights of Salt Lake, and the Mormon Tabernacle Choir is kind of a big deal, so I thought they might like to see it live. Not sure if they liked it or not, but Ryan did say they were not texting on their phones during the program, so that’s a plus. As we were standing there, it hit me again how incredibly AWESOME it is that I get to participate in this AMAZING organization. I get to sit there and watch the phenomenally talented Mack Wilberg conduct the Orchestra at Temple Square and the Mormon Tabernacle Choir. I hear the choir behind me and I get to sit among the orchestra members and watch and listen in amazement. Sometimes I get so carried away by the sheer awesomeness, that I forget that I’m there to play a song and I have to concentrate. 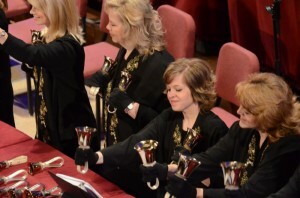 We have been together almost 10 years as the Bells on Temple Square. I have been able to perform on Music and the Spoken word at least 40 times ( I don’t know the actual number, but I’m guessing here). Some people may think it’s a sacrifice to get up early to be to the tabernacle by 7:30 on a Sunday morning, and to come to an extra rehearsal with the choir on Thursday night, but it’s a privilege. I am so honored and thankful that I get to be a part of this group. I often feel like I’m being blessed beyond what I deserve. One of my least favorite things is driving kids places. I try to carpool and combine trips so I’m not just driving ONE kid to ONE place, but sometimes, that’s just what I do. Today I feel like all I’ve been doing is driving people. At 7:20 I took Natalie and 3 others to the high school. At 8:55 I took the two Brazilian boys to the frontrunner station in Lehi. Instead of going home, I was going to make some copies, but I forgot to bring the materials, so I stopped at Costco to fill up the tank (love that gas is only $1.72! ), and then drove to Orem for my rehearsal at the Scera. At 12:00 I was done, so I drove back home. Well, I actually stopped at Kneaders and got myself a salad for lunch. The afternoon was pretty quiet, until about 4:45, when Natalie asked if I could pick up her friend and take them both to another friend’s house. We had dinner, then I took Jenna to a friend’s house at 7:00. I came back home, only to get a call from the boys that they were almost home and could I come get them at the station. Yes, of course. It’s my day to drive. We ordered a pizza for them (delivery, please. I don’t want to go pick it up). I’m so tired today. I think I might be getting a cold. I can’t fall asleep yet because I have to pick up Jenna and Natalie from their friend’s houses around 9. Then I can go to bed. 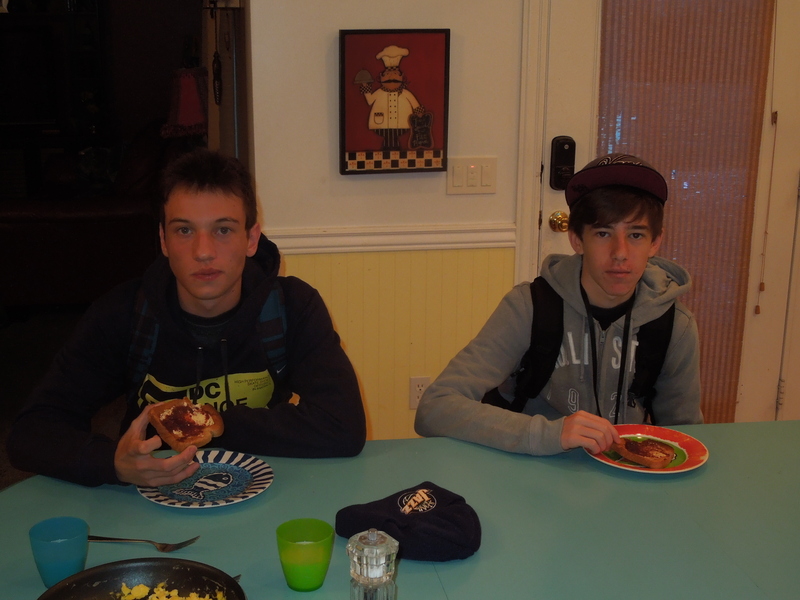 We picked up two cute 15 year old boys from Brazil on Sunday, Arthur and Henrique. We were there with our sign waiting to greet them, and the did not come. Another lady from the group said, “Those boys must have gotten lost. They were with us, and then they went to the bathroom, and I don’t know where they are.” That was nice of her to tell us, but we couldn’t go looking for them, and neither could she, so we just waited. The group of host families and students was grouped over by the luggage thing, and it looked like many of them were missing their luggage. 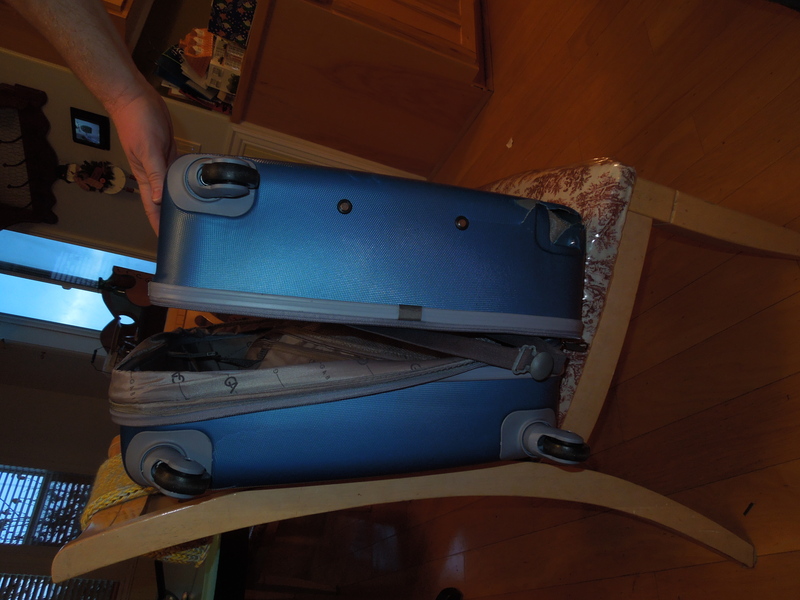 When our 2 boys arrived, their luggage was also missing. 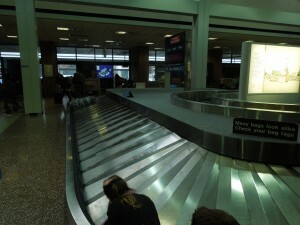 No luggage for you. 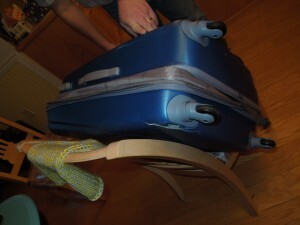 They assured us that it would probably come tonight and someone from American Airlines would bring it to our house. Ok. So, we brought the boys home and let them get settled while we went to meetings. (Seriously? Why so many meetings? Both Jenna and I had interviews, we had to go to a different ward’s sacrament meeting because we would miss ours to pick up the boys, I had to present at “it’s great to be 8) and then there was a court of honor AND a fireside for 11 year old. We missed the fireside.) After dinner, I took the two boys to Wal Mart to buy some clothes. There I was, in the men’s underwear isle with two Brazillian boys. Not something I would ever imagine doing. I had a little trouble understanding that they needed pajamas, but eventually they made me understand. I had to show them how to use their debit cards, swipe, sign the pad, etc. Kind of fun. Monday I had to rush out the door to be to the school by 7, so I didn’t see them. Ryan took them to the frontrunner station in Lehi, where they were to board the 7:45 train, then in Sandy they were supposed to switch to trax, which takes them to their school. I was a little worried about them finding their way, but since there were about 6 kids all doing the same trip, and some of them have already been here a week, we hoped they could follow them. And we had a map and directions printed out for them. They left the directions home. Ryan gave them his cell number. At around 8:30 he started getting the phone calls from a Brazilian number (someone’s mom is not going to be too happy about that). They had gotten on the wrong train and where should they go? He directed them, but got another call later. They had finally gotten to the stop they needed, but couldn’t find the school. They were at AutoZone. Ryan told them which way to walk and I think he called the school to tell them that our boys were lost. I didn’t know any of this was going on, as I hadn’t checked my phone until after 9. I called the school at 10 and they were indeed there. Cold and probably miserable, but there. One of the coordinators called me later and said it’s good for them to get lost at first, then they won’t do it again. He also said that the boys were very cold. Yes, it’s cold in the basement. We had warmed it up a bit, but I guess it needs to be warmer. Instead of telling us or the coordinators, one of the boys told his mom, so then she told the school. Oh, great. We’re being tattled on. I tried to install the whatsapp on my phone. I still couldn’t message the boys, though. We didn’t know what time they would be coming home on the train, IF they made it on the train. But the coordinator called to let me know he had taken them to the station and they should be with the group this time. Just a long day. 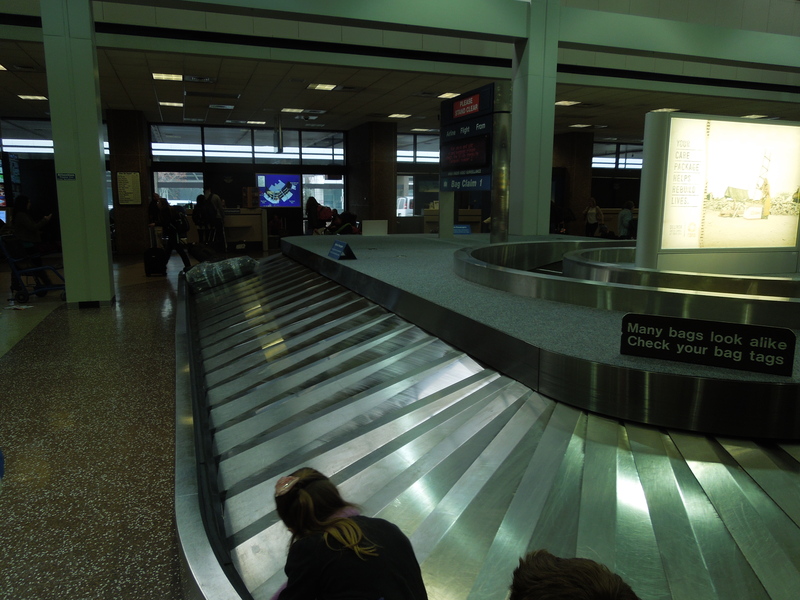 And on top of that, their luggage STILL didn’t come. 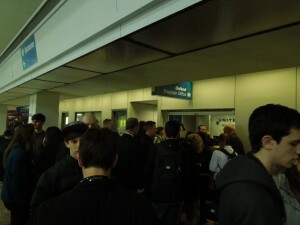 All the others had their luggage. Ryan tried to figure it out, and was on the phone for over an hour (most of that on hold). I offered to wash their clothes, started some laundry for them, and went to bed. I was done. Craptastic day over. What do you know, but the luggage came at 11:00. 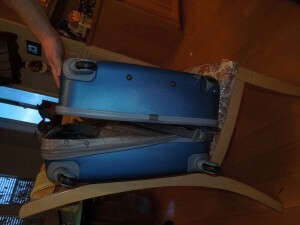 One of the bags was wrapped in plastic and quite damaged. Don’t know what they did to that bag, but it’s missing a wheel, cracked in several places, and really banged up. I asked Ryan to drive them all the way to the school today. They got to sleep in a bit longer, eat a little breakfast, and take that bag to the school so they can file a claim with United Airlines. 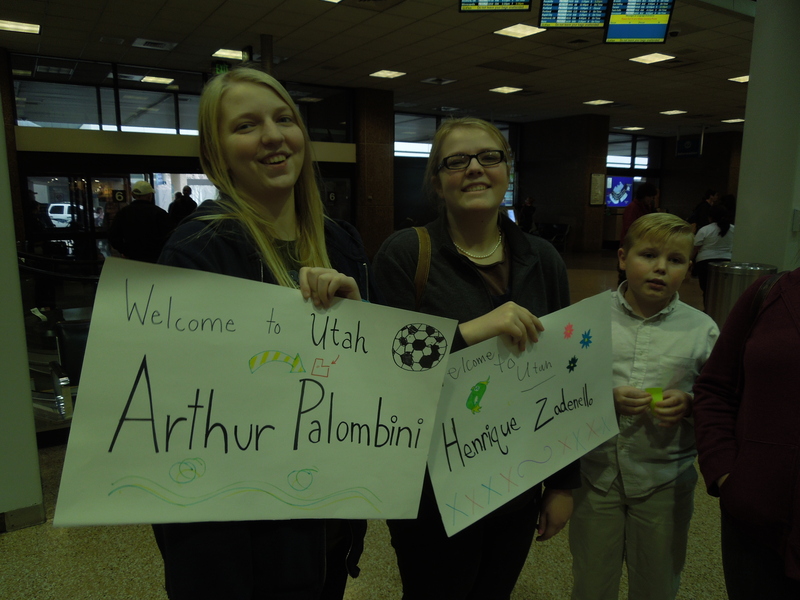 The first day with any exchange students has never been this hard. Let’s hope that we got all our bumps in the road over with and we can all have a great experience.